Griot’s Garage Fine Surface Prep Mitts are the fastest, most comfortable way to remove stubborn above-surface, bonded micro contaminants like fallout, tree sap, water spots, bugs, road debris, and more from your vehicle’s exterior surfaces, including paint, glass, chrome, and plastic. The mitt’s unique diamond patterned polymer surface is seven times larger than a traditional 3″x3″ clay bar. The composition of these innovative mitts is super durable, lasting 10 times longer than a traditional clay bar. Use with Griot’s Garage Speed Shine or Car Wash products to enhance lubricity and maximize your results. We’ve made this essential step prior to waxing, or sealing as easy as waving your hand. PLEASE NOTE: Surface Prep Mitts are not recommended for use on matte paint surfaces, as they may modify appearance. 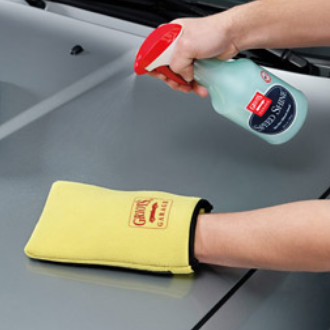 The Fine Surface Prep Mitt is recommended for vehicles where paint correction is not intended. Should any light marring occur follow-up with One-Step Sealant or Liquid Wax 3-in-1.